Arizona is a state filled with beautiful natural wonders, great food, excellent museums, art and other veritable explosions of culture. All these attractions, coupled with the sunshine and large number of top RV parks make it THE first destination for all those RV-ers from up North seeking warmer climates for the winter months. For those worried about an unexpected breakdown in their RV’s functionality, appliances or anything else so far from home, Fix My RV has your back. It is a reliable RV repair shop that can fix everything in your RV. From sinks to stoves, and toilets to air conditioners, Fix My RV can repair or replace whatever you need to get you back on the road. 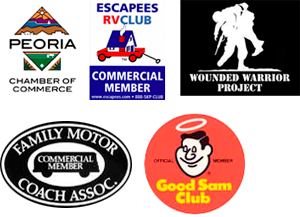 They are experts when it comes to RV maintenance Glendale. One of the attractions that draws RV captains to Phoenix is the multitude of RV parks and other RV accommodations. And, aside from the nice hot weather, there are truly endless activities to do and things to see. There are hikes of varying difficulties, a famous botanical garden, art exhibits, and museums. If you plan on venturing into the wild deserts of Arizona, you want to be confident that your RV is in perfect working order. For any and all RV maintenance Glendale, Fix My RV has your back! The last thing you probably want to do during your time in sunny Arizona is spend days waiting on RV maintenance like with the other guys. Don’t waste your precious time on vacation scratching your head about an issue with your RV or shopping around. You won’t find friendlier service or better deals anywhere else! They will get you up, running, and back out on the road so you can move on to your next museum visit, hike, event or wonderful meal. Make sure to remember where to go for your RV maintenance Glendale needs. Visit the site, call, or stop by to learn all Fix My RV has to offer!